A year ago, we introduced the great things happening at John Yowell Academy at The Piedmont School. John Yowell Academy (JYA) is the high-school program within The Piedmont School, located in north High Point. The program, which serves students in grades 9-12 with attention deficit disorders or language-based learning differences, such as dyslexia, provides a diploma-bound high school education while simultaneously providing students with advocacy strategies, individualized education, and goal planning. JYA students meet the profile of a Piedmont School student. They are students with average to above-average cognitive ability, with a diagnosis of either ADHD or a language-based learning difference, such as dyslexia or dysgraphia. JYA students do not have severe emotional behavioral disorders and must have updated educational evaluations. The program has grown each year since its development in 2014. Four years ago, the JYA program consisted of two students. This school year, there are 25 John Yowell Academy students, with its largest freshman class to date. The program intends to continue growing to some degree, but never sees itself being larger than 12-16 students per grade level. A key component of the program is being able to provide individualized instruction and goal planning; therefore smaller class sizes are key. With each new school year come unique program offerings. The JYA Program offers the traditional course work required for an NC High School Diploma that all high schools offer, but it also offers several unique courses to meet elective requirements. During the 2018-2019 school year, JYA instituted its Life & Learning Courses. These courses are taken each academic year and offer direct instruction in a variety of real-world skills, such as creating a resume, choosing short-term and long-term goals, managing a budget, cooking a meal, changing a tire, and career research. This fall, JYA students researched Carol Dweck’s Growth Mindset (the understanding that abilities and intelligence can be developed). Students took what they learned and created a Growth Mindset for the John Yowell Academy program and designed posters illustrating these qualities. Life and Learning Skills Teacher Barbara Knight believes, “A lot of high school students experience so much anxiety because such a huge emphasis is placed on core academics and not enough (if any) is placed on the skills students will need to be successful in their everyday life.” This is an important foundation block of the JYA program—not just to provide a strong academic experience, but to prepare students for daily life after high school. To further the program’s focus on lifelong success and creating well-rounded students ready for the world outside the school walls, John Yowell Academy has a strong focus on service learning. All JYA students are required to complete both in-school and in-community service hours before graduation. JYA students can be seen around campus as assistants for middle school athletics, serving as reading buddies to younger students, assisting with lower-school recess, and taking on projects of their own, like sanding and repainting outdoor furniture for school common areas. Outside of school, students have volunteered with local food banks, the Salvation Army, animal rescues, and by cooking meals for the homeless. JYA provides a rich academic experience, as well, for its students. This year the program was awarded chapter membership in the National Honor Society. The inaugural chapter induction took place in January, with six inductees. These members will begin organizing and completely leading their student service project for the spring, while maintaining strict academic requirements. JYA students must satisfy all North Carolina Graduation Requirements for a high school diploma (including CPR certification) and must also satisfy JYA requirements for service learning. 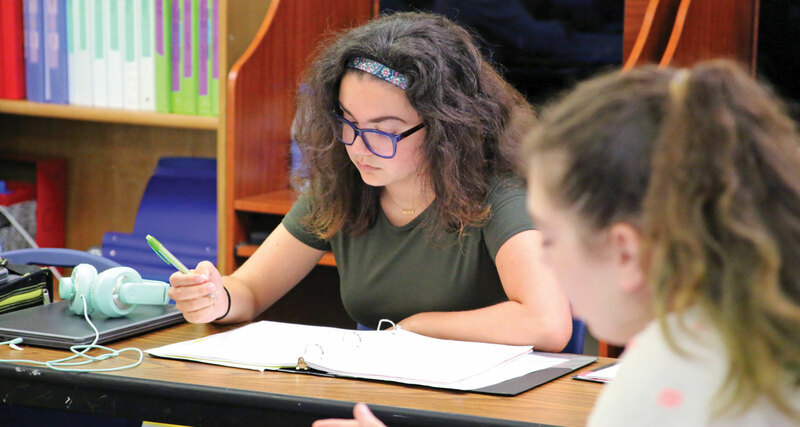 While course requirements are similar to those of other high school programs, students in the JYA program are given the individualized instruction along with strategies for their learning style that they need to be successful. This year, all JYA students received Chromebooks that travel from class to class with them. These devices serve for notetaking, essay writing, research, and even collaborative projects. Students have also become versed in available assistive technology extensions and programs that can serve as useful strategies to help them complete their work, despite the learning differences they may struggle with. With the growth and development of the John Yowell Academy program, in addition to the lower and middle school programs of The Piedmont School, space is something The Piedmont School hopes to add more of quickly. The Piedmont School is currently in a capital campaign to expand the campus, nearly tripling its size. The new addition would bring a gymnasium and new lunch area for all students, but would also add new science/technology labs and about nine new classrooms dedicated just to the 7th-12th grades. To learn more about John Yowell Academy at The Piedmont School, visit www.thepiedmontschool.com/academics/JYA or call (336) 883-0992. Tours are individually scheduled, and The Piedmont School is currently enrolling grades K-12 for the 2019-2020 school year.